Employees are a company’s greatest asset, and establishing a strong and attractive employee brand starts with finding top talent globally to build a workforce. Now, more than ever, it’s important to verify all of the information regarding an applicant’s history to help protect the company’s reputation and its staff members. You can find the talented and dedicated employees your company deserves. 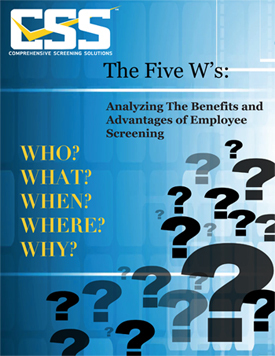 Learn the who, what, when, where and why of employee screening in this white paper by completing the fields below.